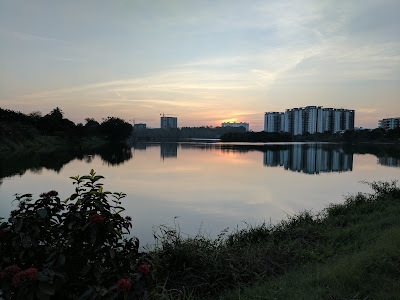 It was a beautiful evening - the clear sky, the bright sun setting in the backdrop behind the concrete high-rise buildings, a pristine lake reflecting the sun rays, 100s of chirping birds of all varieties perched atop the trees, a paradise for an ornithologist, active residents from the neighboring localities - some jogging, some brisk walking and the rest casually taking a stroll with their loved ones. It was such a happy sight everywhere as I took a walk around the lake. I prefer not to put on any earphones and listen to music. There’s enough music around, thanks to the birds, ducks and voices of other people. And yes, there’s my inner voice too, for which I need to keep my ears open. My thoughts wandered back to the past - similar evenings during my school days where I would sit on the terrace studying hard and occasionally taking a break to listen to the birds returning home in the evening, admire the shades and hues of sunset creating a collage of colours in the sky and listen to the hymns and ringing bells from the nearby temple. They weren’t really distractions but perfect company to focus on the chapters to read and concepts to grasp. Focusing for 2 hours at a stretch was a normal thing those days. And now I couldn’t recall the last time when I focused on ONE task for 2 hours. Maybe, a few times back in 2009 when I was winding up my MBA. After that, zilch, zero. Cooking gives me that flow but it is not really an intellectually stimulating activity per se. Given the nature of my software product management work, I always tend (or expected) to be distracted with emails, chat messages, calls, umpteen number of tabs open in my browser etc. I crave for that focus, that unhindered productivity, that complete concentration on the task at hand without any distractions. Sometimes I feel the urge to get back to studies to bring back the focus. It’s been nearly 7 years since I graduated from IIMB. Whether I want to pursue more formal education or not, I’m not sure. But I clearly need more focused sessions of reading, writing, coding and similar intellectual pursuits. I need to get into that flow, to be “in the zone”. One of my themes for 2017 is “More outdoors, less screen time”. I hope the “less screen time” will rekindle my focus and bring back my attention. It is not lost, it’s hidden somewhere inside my consciousness after the onslaught of social media and smart phones in the last 5-6 years. I’ll diligently put the required effort to bring back the scarcest resource in today’s world.